On what Windows platforms can I develop and deploy AVR 4.1 and AVR 5.0? Will AVR 4.1 and AVR 5.0 coexist on the same development box for development purposes? No, AVR Classic 4.1 requires Windows XP and AVR Classic 5.0 requires Windows 7/8/10 for development. This isn’t a decision we wanted to make, but one that was imposed by shifting the development of AVR Classic 5.0 from an older Microsoft Visual C++ compiler to the latest version of that compiler. Although your chart doesn’t show it, I am currently using AVR 4.x to develop on Windows 7? Is your chart wrong? We do know that some users claim to be using AVR 4.x on Windows 7/8/10 for development successfully today. We’re glad that’s working for them but we can’t recreate that success consistently in our testing lab. While you may find success with AVR 4.1 on Windows 7/8/10, we do not support either Windows 7/8/10 for AVR Classic 4.1 development. If you are doing this and will continue to, we suggest you test things thoroughly after every Windows update is done to your development machine. Is AVR 4.0 still supported? No. Support for AVR 4.0 ended with the arrival of AVR 5.0. AVR 4.1 is the oldest version of AVR Classic for which we currently offer support. How does the expiration of Windows XP affect AVR Classic apps? Microsoft stopped supporting Windows XP on April 8th, 2014. 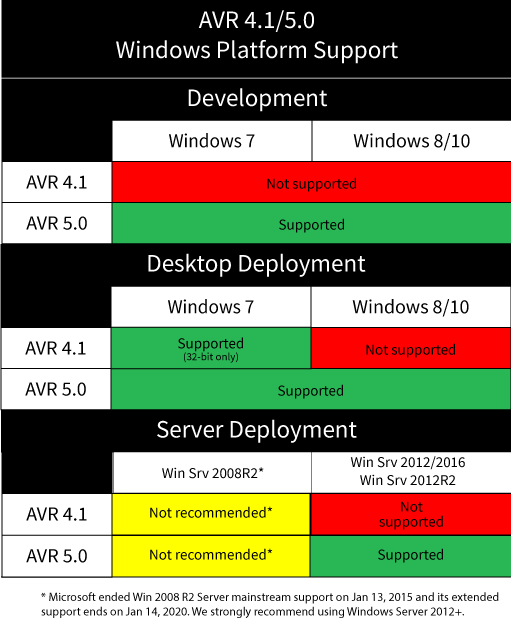 Most AVR Classic customers moved to either Windows 7 or Windows 8 prior to that date. If you are still using Windows XP please be aware that although AVR Classic apps still run on it, ASNA is no longer doing any product testing on Windows XP (we don't trust using it in our network). If you are going to continue using Windows XP, we encourage you to download and read the free IDC Windows XP risk assessment whitepaper from Microsoft. We do strongly recommend that ASNA customers stop using Windows XP as soon as possible. Will my third-party controls (OCXes) continue to work with AVR Classic 5.0? (Translation: Component Source will gladly sell you deprecated copies of the Sheridan controls—but don’t call for support!). The behavior of third-party controls is completely out of our hands so when controls have issues with Win 7 or 8, there isn’t anything we can do about that. Customers using third-party controls will need to test their apps vigilantly. Will the AVR Classic graph control continue to work? It has worked in our tests so far, but the AVR Classic graph control was licensed from Graphics Server and it is one of the companies now out of business. It’s quite likely that the graph control will continue to work with Win 7 or 8, but if it doesn’t, you’ll need to find a workable alternative. Can existing AVR Classic 4.x code be compiled with AVR Classic 5.0 with no modifications? Yes—no modifications to your code are required. Simply open the 4.x project in 5.0 and recompile. Do note that upon opening the 4.x project, as in past versions, the 4.x project is converted to a 5.0 project—and there is no going back on this process. Be sure to make a backup of your 4.x project to project yourself against unseen issues. My AVR Classic 4.1 application is working fine on Windows XP and I’ve even deployed some of them successfully to Windows 7. The effort and expense and to move my application to AVR Classic 5.0 doesn’t seem worthwhile to me. What’s the downside of me simply continuing to use AVR Classic 4.1? Ultimately, how you manage the persistence of your AVR Classic applications is up to you. We think it is very important for you to carefully consider your options and make solid, informed decisions. Several customers have told us that their AVR Classic 4.1 apps are working fine on Windows 7 and there isn’t a justification to attempt to do anything else to these apps. For mission critical (and maybe we should also say revenue critical!) applications, we think that sticking with AVR 4.1 and Windows XP/Windows 7 is a short-term way to avoid addressing a very real problem. Investing in AVR Classic 5.0 was an expensive project for us—but one that we felt was important for our Classic customers. Our discussions with customers worldwide have confirmed there are a great many AVR Classic applications still in use today, and support for them is important after April, 2014. Without AVR Classic 5.0, the viability of AVR Classic applications diminishes greatly in the spring of 2014. Yes, there are constraints and concerns in getting your AVR Classic 4.1 apps to AVR Classic 5.0, but we think they are surmountable. Especially given that for not much effort, AVR Classic 5.0 dramatically extends the life and viability of your AVR Classic applications. You mentioned that you think it’s very important that we should not use AVR Classic 5.0 as an excuse to avoid the inevitable—that we still need a long-term solution for the future of your AVR Classic COM code. Why can’t I count on AVR 5.0 lasting as long as its AVR Classic predecessors? It’s not the persistence of AVR Classic 5.0, specifically, that we’re worried about. It’s the inevitable timing out of the COM model that worries us. We’ve already noted the effective collapse of the ActiveX vendor marketplace. We know that Microsoft has built into Windows 7 and Windows 8 a workable persistence model for COM applications. However, we don’t know how many more releases of Windows will continue that COM persistence model. There may come a time when Windows simply isn’t able to support the COM model—and we think strategically we should all be planning on that day. We once had a customer say to us, “I’ll worry about the demise of the COM model when MS Office stops relying on COM.” That’s a good observation—we might well be able to read into the future by watching Office closely. After all, who has more legacy COM than Microsoft? With the advent of Office 365, we think the tea leaves are there to read! Can I run AVR 5.0 Windows apps on a tablet? AVR 5.0 isn’t optimized for tablet use, however it is possible that you can run your AVR Classic 5.0 apps on Windows 8/10.x-based Microsoft Surface Pro tablets (but not the Windows RT-based Surface tablets). Test your app, and especially your user interface and third-party controls, on the Surface Pro tablets thoroughly. You may need to make some minor changes to the UI for the best user experience.